Venezuelan opposition leader Juan Guaidó has vowed to open humanitarian aid routes into the country in defiance of the government. Mr Guaidó, who has declared himself interim president, called on volunteers to help with distribution and said his plans would be ready next week. Footage shows soldiers blocking a key bridge at the border with Colombia. A government official called aid “a Trojan horse” and said the country had a duty to defend its borders. “According to our constitution, we have the right and the duty to defend our borders peacefully,” said Freddy Bernal. 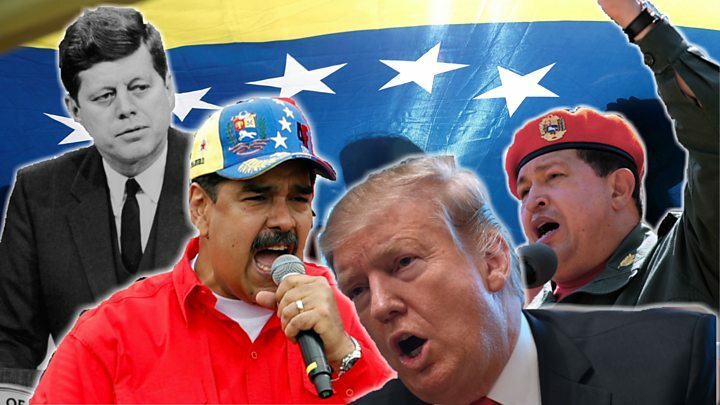 He accused US president Donald Trump, who has endorsed the opposition leader, of just wanting to exploit Venezuelan oil. Millions of people have fled Venezuela as hyperinflation and other economic troubles render food and medicines scarce. Since the outbreak of the current political crisis, Washington has announced sanctions on the Venezuelan oil industry. President Nicolás Maduro, who has the support of the army, has rejected letting foreign aid into the country. Last week a tanker and cargo containers blocked the Simon Bolivar International Bridge, which links Venezuela to its more stable neighbour to the west. The blockages were still there on Friday, and many soldiers were seen standing guard. Mr Guaidó does not control any territory in Venezuela so, instead, he is planning to set up collection centres in neighbouring countries to which Venezuelans have fled. Food and medicine organised by the US federal government’s USAID agency arrived on Thursday and have been stored at a warehouse on the Colombian side of the border. The agency has been bound up in international politics before – Russia expelled it in 2012, citing “attempts to influence political processes through grants); and Bolivia expelled it the year after, accusing it of seeking to “conspire against” the Bolivian people and government. Both Russia and Bolivia are allies of President Maduro in the current crisis. 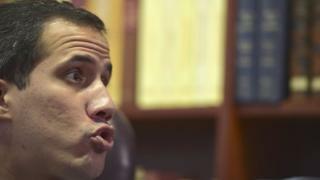 How far will Guaidó go? Mr Guaidó has warned many Venezuelans are in danger of dying without international aid. Speaking to AFP news agency, he said the groups he was putting together would “make a first entry attempt” at the blocked bridge when they had gathered enough supplies. He said he expected this to happen next week. Nicolás Maduro: Dictator or defender of socialism? It would be “almost miserable at this point of huge necessity” for the military to block any convoy entering, he said. A number of Venezuelan leaders have also appealed to the military to allow aid lorries to cross into the country. Asked whether he would authorise the intervention of foreign military forces, Mr Guaidó said: “We will do everything possible. What’s the background to the crisis? He says the constitution allows him to assume power temporarily when the president is deemed illegitimate. On Saturday he said protests would continue until his supporters had achieved “freedom”.